Arghhhhh! Welcome once again to Frightening Fridays. This is your pirate captain speaking. We be weighing anchor in Absolute Terror Cove, while I prepare to tell you the most chillifying tale to ever sail the Seven Seas. So, grab your peg legs and your eye patches and get ready to be super scared while I sit here in the complete safety of my brightly-lit living room and think about how scared you're soon going to be. Because I mean you're going to be so scared. Scareder than the time I told you a story about evil sewer clowns. And scareder than the time I told you a story about a depressed pumpkin. And a whole lot scareder than the time I told you a story about gourmet zombies. Maybe a bit less scared than the time I told you about a babysitter and a hook-handed murderer. But certainly more scared than the time we talked about some very nice witches who did not at all deserve to be burned at the stake. See what I did there? I linked back to all of the Frightening Friday posts from last October, so that you could go back, read them, and pee your pants in fear all over again. Mwahahahaha! So, with no further self-promotion or prattling on about how much I'm going to scare you, here is the first tale of terror. It's hard to be a ghost pirate ship captain. For one thing, your ghostly hands go right through the helm of the ship, winds blow right through the mizzen mast with no effect on the direction of the ship, and your crew forgets that making you walk the plank in some feeble attempt at mutiny is only going to get your corporeal form all wet. So, what happens when you become a ghost pirate ship captain is that it's fun for about twenty years, but later on when you're drifting around, unable to control the direction of your ship, and being forced to spend an eternity with your annoying ghostly crew, you get pretty tired of the whole situation and wish you had just gone down to Davy Jones's locker like a normal dead pirate. This was the case for Captain Strangebeard. Why was he called Captain Strangebeard? Because he had accidentally shaved off half his beard. When the actual ship sank the next day and the captain drowned, his ghost was forever cursed with half a beard. So, he was Captain Strangebeard. The year was 2010. The day was Halloween. The sky was dark. The sea was rough, and the pirates were fresh out of ghost grapefruits, so they were all suffering from ghost scurvy. "I have an idea!" shouted Peg Face the Pirate, who was first mate of this very salty, very dead crew, "Let's make the captain walk the plank!" "It be a mutiny!" cried Parrot Face the pirate, who was a dead parrot pirate who frequently said parroty pirate things. "OH MY GOD!" said Captain Strangebeard, "I explained this to you two centuries ago. You can't mutiny me. I'm dead." "Shiver me timbers!" said Dead Fish Breath the pirate, who was the ship's cook. "We be dead?" "We have been floating around the Seven Seas for almost five centuries. How could we be alive at this point?" said Captain Strangebeard for the twenty-third time that week. "I thought that be a bit weird," said Peg Face the Pirate. "I want my mommy!" said Crybaby the Pirate. "You can't have your mommy! She's been dead for hundreds of years!" said Strangebeard. "When we be getting our share of the treasure?" asked Moneybags the Pirate. "Are you a complete and utter moron? Have any of you listened to one word I've said in three centuries?" asked Captain Strangebeard. "The treasure is in Davy Jones's locker. It's gone. The ship sank. This is a ghost ship." "Like, ghosts?! Where?" said Shaggy Beard the Pirate. "Rhosts! Raggy!" said Scooby the Pirate, who dove under a rug to hide. "Okay, seriously, you guys?" said Captain Strangebeard. He finally retreated to his ghostly captain's quarters to get away from his utterly stupid crew and write in his ghostly ship log. Day 167,926. Crew threatening mutiny again. They are so, so stupid. I mean, so incredibly stupid. Will this voyage ever end? Suddenly, someone knocked at the door of the captain's quarters. "Captain! Captain! Make haste! There be a ship on the horizon!" Captain Strangebeard rolled his ghostly eyes. Not again. "Captain! There be people on board drinking rum and dancing strangely!" "You brought me up here to look at another Carnival Cruise Ship, Peg Face. I told you last time, those people are on vacation," said Strangebeard. "Maybe they have treasurrrrre!" said Peg Face. "Probably," Strangebeard replied, "But what are we going to do? Shoot them with our ghost cannon?" "We pillage and plunder and take no man alive!" cried Peg Face. "Okay, let me know how that goes for you. 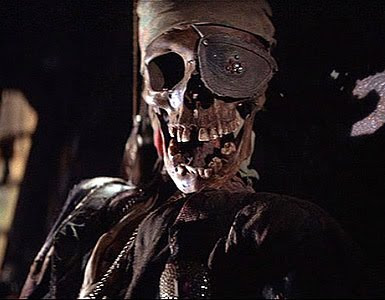 I'll be in my quarters holding my ghostly flintlock to my head and praying for release from you idiots," said Captain Strangebeard. He went back to his quarters. "Argh! Take no man alive!" cried Peg Face. And the pirate crew prepared the ghost cannon and fired it many, many times into the side of the Carnival Cruise ship and were baffled that it never made a dent. Eventually they gave up and went back to planning their mutiny of Captain Strangebeard. The Flying Dutchman sailed on for an eternity, which it was eternally annoying for the captain. Indeed, this be your most frightening tale yet! All me 206 bones be chilled—including my femur, which is usually quite brave. I can't wait for the next one. You owe me new underpants.. AGAIN!